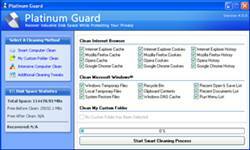 Platinum Guard by Reohix, is a Windows application which can remove any unnecessary files from the computer for speeding up the Windows performance and freeing up some hard disk space. Beside that, it also able to clear the sensitive information related to the browsing history and behavior that store in the Internet browser. The sensitive information may contain the files, video clips or websites that have been downloaded, watched or visited. Improve the computer’s performance by getting rid of junk and temporary files that clog the system. Recover the valuable free hard disk space that otherwise would have been occupied by junk and temporary files. Completely clear the tracks to render invisible the recent activity on personal computer. Compatible with all the latest popular web browsers including Internet Explorer, Firefox, Opera and Google Chrome. Reohix is giving away full version of Platinum Guard 4.0 as a Christmas present and gift, where it normally costs $13.99 to buy. No registration is required to download the full version copy of Platinum Guard 4.0 for free, and there is no hidden costs and no third-party software bundles too. To grab the free full version of Platinum Gruard 4.0, just download and install . No serial key number or serial code required.